Apple's new voice input-based digital assistant, Siri for the iPhone 4S pits the iPhone against Android's Voice Actions, a popular feature for Android phones running Android 2.2 (Froyo) or higher. Both Siri and Voice Actions promise to make your life easier by letting you speak--rather than type--your messages, web searches, notes, and navigation. In November, Google also plans to update Android's voice input engine with Android 4.0, or Ice Cream Sandwich on the new Samsung Galaxy Nexus. ICS will include a new hands free voice-activation feature, as well as an overhauled voice input engine. With Siri just out and ICS' new voice features on the way, the two companies look to be gearing up for a voice-activated showdown. But how do the two competing feature sets compare? Are Apple and Google offering the same services, or does the newcomer Siri offer advantages that even improved Android Voice Actions can't match? Here's a look at the feature highlights for both services, as well as a few third-party Android apps that can help augment Voice Actions if you happen to start feeling Siri-envy. There are a number of features in which Siri and Voice Actions can do the same thing--such as dictating text messages and emails, playing music, calling contacts from your address book, searching the web, and dictating notes. You can also open webpages using both services, though Siri first routes you through a web search and makes you select a result. Android can open a webpage directly using commands such as "Go to Wikipedia." Some of these voice command features, such as calling a contact or playing music, were also part of the iPhone's previous voice control features. However, in my experience, the iPhone's pre-Siri voice control wasn't particularly reliable. My iPhone 3GS, for example, is obsessed with playing Radiohead, no matter what I ask it to play. 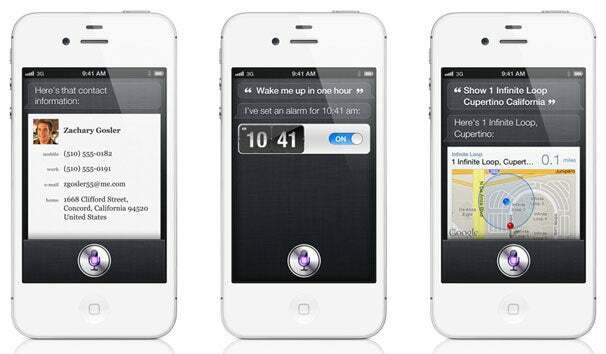 Apple appears to have improved its voice command features with Siri, at least for iPhone 4S owners. There is one obvious advantage that Voice Actions has over Siri and that's turn-by-turn voice-guided navigation. Voice Actions is integrated with Android's Google Maps app that includes free turn-by-turn directions (U.S. only). All you have to say is something like "Navigate to 501 Second Street in San Francisco," and as long as your phone understands you, you'll be on your way with Android's voice-guided navigation. Apple doesn't offer a Siri-enabled turn-by-turn navigation app for the iPhone, although you can get directions from Google Maps (sans voice guidance). Android has the advantage for navigation at the moment, but this may change if Apple opens up Siri integration to third-party apps. Apple says Siri can draw local business information from sources such as Yelp, but Siri can't call a business directly unless you have the number in your contacts database. Voice Actions, on the other hand, can go online for you, do a business search, extract the phone number, and automatically dial it for you. Perhaps the most novel new voice-command feature in Ice Cream Sandwich is the "open microphone experience," which lets you activate voice input just by talking to your phone--instead of pushing a button. Siri lacks this feature, which is also present in other voice-input services such as Sensory's Trulyhandsfree technology. ICS also has a new voice input engine that Google says will let users employ a more natural language approach to voice commands. The new Android OS also has a spell checker that will gray out possible dictation errors as you speak so you can go back through your SMS, email or note and quickly correct any problems. Apple is offering Siri in English, French, and German, and plans to add more languages in 2012 including Chinese, Italian, Japanese, Korean, and Spanish. Voice Actions for Android is available only in English at the moment, but Google is suggesting Ice Cream Sandwich's new voice input engine will be able to accept almost any language. That's a big claim, however, and it's not clear just how many new languages ICS' voice command features will be able to recognize. Where Apple starts to really pull away from Voice Actions is with Siri's personalization features. For example, Siri is able to process a lot of natural language requests to give you the information you need. You can ask Siri if you will need an umbrella on Monday and it will understand that you are looking for weather information. 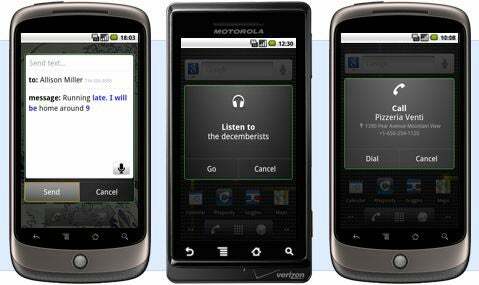 Android's Voice Actions currently requires direct commands such as "navigate to..." or "note to self," and it's not clear if Voice Actions will be able to process such natural language commands in Android 4.0. There are many other personalized features in Siri, including the ability to set reminders based on your location. You can ask Siri to remind you to pick up milk once you leave work, or to buy donuts for the office as you're leaving home. Location-based reminder functionality can also be used in non-Siri devices running iOS 5 through the Reminders app. Siri can also process and store your personal relationships. You can tell Siri who your mother is, who your siblings are and so on. And, as long as those people are in your address book, Siri will call them upon request. So you can say, for example, "Call Mom" instead of "Call Joan Smith" (or whatever you mother's name happens to be). Siri also offers a number of extras that Voice Actions currently doesn't have, such as the ability to schedule calendar events, get stock info, retrieve basic facts and figures from Wolfram Alpha, and set alarms and timers. To overcome these deficiencies, Android users can augment Voice Actions with a number of third-party apps such as Vlingo (free), Speaktoit Assistant (free) and Voice Actions Plus ($2.99) by Pannous. These apps claim to add more Siri-like functionality including the aforementioned alarm settings, adding calendar events, and asking for basic facts and figures. Vlingo even lets you open other apps on your phone with your voice, update your Twitter and Facebook statuses or check-in on Foursquare (a version of Vlingo is also available in the iPhone App Store). Speaktoit Assistant claims it can process natural language similar to Siri. Third-party apps aside, Siri appears to have the advantage over Voice Actions and Google doesn't have much of an answer with Ice Cream Sandwich. But now that the race is on for better voice commands, who knows what Google's next major Android update--reportedly named Jelly Bean--will bring?